Forgetting what has happened up to now, and starting with a clean slate from our current position in the league and our squad as it is with new signings, what would people view as a successful rest of season? I am always looking up personally, and I would class getting a 10th place finish as a success, and anything less than 12th unsuccessful. Interested to know what others think. I'd be happy with a top half finish from this point, anything lower than 16th will be disappointing, I expect to finish 12th-14th however. i'll post here, but after Saturday when, presumably, there will an opportunity to see some of these new names in action. it will be a more realistic appraisal! Success from heroin ? you were close to a hash up ! Remember it took both SC and Wardie three years to build promotion winning squads, next year is the acid test for GJ but we are edging in the right direction. SC took us from Dr Martens to L1 - He took over in 96/97 mid term and got us to L1 by the end of 2001/02 - so 3 promotions in 5 and a half seasons. Quite how that is 3 years to build a promotion winning squad escapes me. I think we'll be more consistent in the rest of the season, taking more of the many chances we create whilst having the odd "disaster" game. I think top 10 is realistic given how many points we SHOULD have had in the first half, only to see the opposition take one of their few chances and us miss pretty much all of our many. We've got Mansfield and Colchester performances in the locker and if we can bring those out more often then the play-offs are still possible. Put like that i agree - but there is a case for dividing 5 1/2 by 3 - but anyway who wants to quibble about decimal points!! Rome wasnt built in a day. GJ has done it previously, I'd trust him to build a team that can challenge next season, we've made progress every year under his mgmt. Robin - we struggled last season, it went down the last couple of games. How that is progress escapes me. Because we'd progressed from the league below. Wherever we finished in L2 last season was higher than where we'd finished the season before, 1st in the NL. This season I'm fairly certain that we will finish higher than last season and we'd then expect to finish higher again next season. Because it survived in the league higher than the one we were in the season before. When Ward kept us in L1, was that not progress, even though it was a struggle compared to the previous promotion season in L2? I hope you are right. Listen I am chuffed to bits to have a manager of GJ's experience , also having watched the club wallow in non league for decades I am chuffed we are in the EFL. I'm just a grumpy old git at times !! But look at other recently promoted sides like Mansfield, Luton etc they also came up and didn't do well either they had to build gradually. Only really Bristol Rovers in recent times at least have come up and challenged immediately, Lincoln this season have been mostly mid-table but now picking up steam so could be another exception but they are hugely bankrolled by the FA Cup run. Not sure that is true either when you see sides like Exeter and Accrington challenging on smaller budgets than ours. Each transfer window we get a few more good players come in. It can't be easy attracting players with a lot of competition in league two. Last January we got Winch & Boyle, in the summer window we got Mo, Flinders, Dawson, Sellars, Nige, Graham. Now we are seeing some more players come in who I hope will step us on again. I would have thought this season we should be pushing for the top half as people have said - especially if we can go on a run. Then if we can keep the majority of the squad together over the summer - a play off push might well happen. If we lose Mo, Winch and others then we will have to start again. A lot of it comes down to how well you use your 5 loan slots too. As we saw with the likes of Butland, Garbutt - it can make the difference between a side pushing for the automatic promotion places and one hovering around mid table. As an aside, we must get Winch to sign a new deal so we can take a fee when the league one clubs come calling. To lose him on a free would be horrendous. At least with Mo we will be able to fund a replacement. Fully agree, the best news we can have this January is Winchester signing an extension. At least with Mo we know he's going nowhere without a very big fee. I think the money thing does com into it when you first arrive in L2 from the NL as, Rovers being the exception, you have to generally overhaul your squad and that takes time and money as many other clubs have shown. Lincoln had the money to improve their squad but now they've lost their two centre backs it will be interesting to see how the rest of their season pans out - but they have money to get decent new guys in if they haven't already. The likes of Accrington and Exeter have been putting their squads together for years, getting the core right and then hoping the cheaper players around them are good'uns. Rovers put together an exceptionally strong conference side. They still strengthened when they came up. Your Exeter and Accrington examples are spot on Shade. Burton too - they knocked on the door for ages, and eventually got enough quality around the core to go up. Torquay the reverse; a few play off seasons with a strong core, but couldn't add the quality one season and went down. Truth is you never know how loans will work out. Our lodger (Yeovil) went to Bristol City vs Watford over Christmas/New Year. Just got back to our place this week, and last night started telling me about this great young sub City brought on who added more threat with pace and skill, running towards the box and shooting, who he thinks they should play more often or at least loan out to lower Championship or L1. Player name? Freddie Hinds. To all intents and purposes Hinds should have been great for us, or at least just as good as the short-term punt from non-league, Mo. Just didn't work out, whilst Mo was a revelation, and that's the risk when taking on young loans from above or taking a punt on youngsters from below. You only need for three or four good-on-paper loans to end up like Hinds or Flatt for your season to be a struggle. You only need three or four to end up like Garbutt or McCann for your season to be a promotion one. And some loans look ok so you sign, like Pack. And some look ok so you sign, like Artus. Yes the manager has to find the best players. But when all you can judge is how well they do in youth football or you can only judge potential a fair chunk of luck is involved. Having this team click and play some exciting and attractive football which will A. Keep Winchester here B. Attract more quality in the summer and a finish 7/8 points off the playoffs will be nice. Please, full red and white stripes for next home shirt or maybe even...hoops. Oh, please not hoops. If we go for full stripes again, I hope it's fatter stripes like 06/07, rather than the thinner 15/16. Not sure about Exeter,they are developing 2 sides of their ground,how ! if they have no money ? 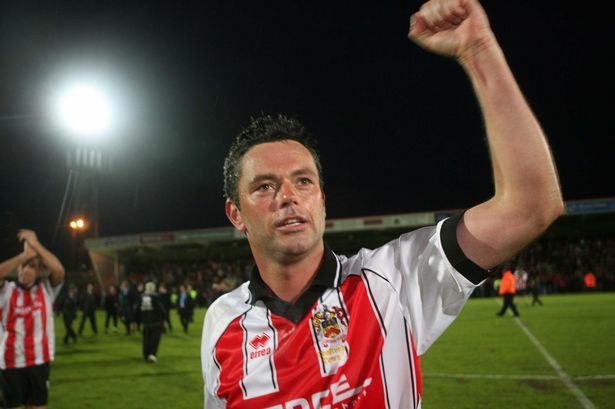 Exeter had the third smallest wage budget in league two when they reached the play-off final. I know they netted £800k for the player they sold to Brentford and another six figure fee for a young lad they sold to Chelsea, I suspect they are using those funds and some help from local council to update their ground. This explains how Exeter's ground is funded. The Council sold land behind the ground to a developer to finance it. As usual in the current market the developer is building student accommodation (boom sector in university cities - Exeter get a few applications a month submitted by developers). I wonder if any will go to matches!